« Be Found On Twitter: Where Is The Opt Out Button? comScore released a study today on social networking access via mobile browsers. comScore’s study found that 30.8 percent of smartphone users accessed social networking sites via their mobile browser in January 2010, up 8.3 points from 22.5 percent one year ago. Access to Facebook via mobile browser grew 112 percent in the past year, while Twitter experienced a 347-percent jump. 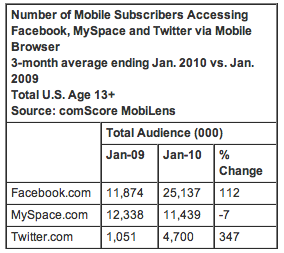 However, the growth in mobile access of social networking sites trend appears to have missed MySpace.com which instead saw a 7% drop in its mobile visitors during the same time period. Why isn’t the MySpace audience making the leap to mobile? This entry was posted on March 3, 2010 at 3:37 pm and is filed under Facebook, Marketing Communications, Mobile Access Of Social Networking Sites, MySpace.com, Search Engine Marketing, Search Engine Marketing Firm, Search Engine Optimization, Search Engine Optimization Company, Search Marketing, Twitter. You can follow any responses to this entry through the RSS 2.0 feed. You can leave a response, or trackback from your own site.